Beginners — Gavin Lade (Little River 1) 11.861 elapsed time, .080 reaction time defeated Slate Crisp (Xtreme) 11.860 elapsed time, .026 reaction time. Advanced — Camron Nelson (Little River 4) 8.908 on an 8.90 dial-in, .094 reaction time defeated Landon Exner (Little River 4) 8.916 on an 8.90 dial-in, .100 reaction time. 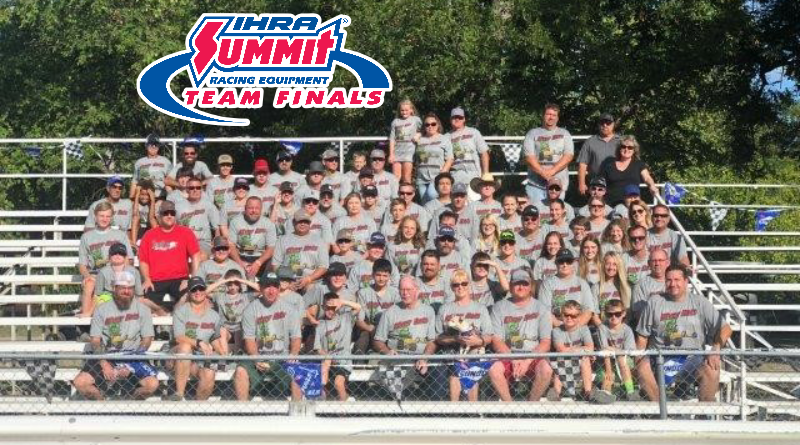 IHRA Summit Team Finals continue September 12-16 for Division 9 (Raiders) & Division 2 (Heatwave) at the Darlington Dragway in Hartsville, S.C. and September 13-16 for Division 5 (Thunder) at US 131 Motorsports Park in Martin, Mich.